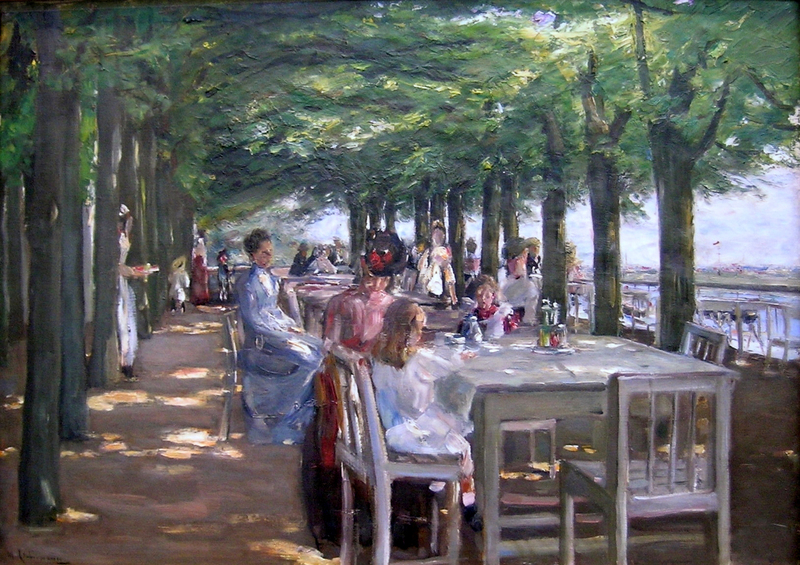 Max Liebermann, Terrasse im Restaurant Jacob in Nienstedten an der Elbe (The Terrace of the Restaurant Jacob in Nienstedten an der Elbe) (1906), oil on canvas, 100 x 70 cm, Hamburger Kunsthalle, Hamburg. WikiArt. The main group of German impressionist painters followed the French Impressionists, with Liebermann and Slevogt continuing to use the style well into the twentieth century. However there is one painter who appears to have anticipated many impressionist elements when Constable and Turner were active in Britain: Carl (or Karl) Blechen. Blechen was born in 1798 and first apprenticed to a banker. In 1822 he studied at the Berlin Academy, then travelled to Dresden and Switzerland. He initially worked as a stage painter at the Royal Theatre in Berlin, but was dismissed in 1827. 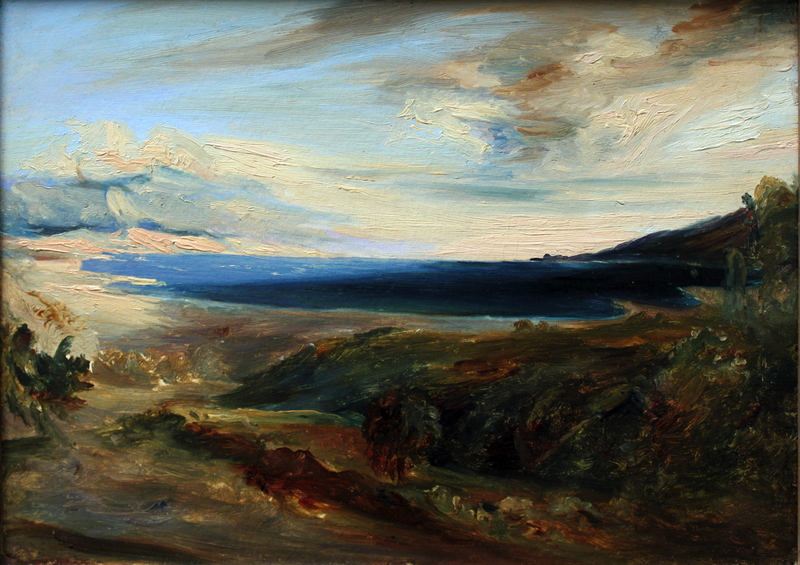 He travelled to the Baltic coast in 1828, then to Italy, where he painted plein air in the Roman Campagna. 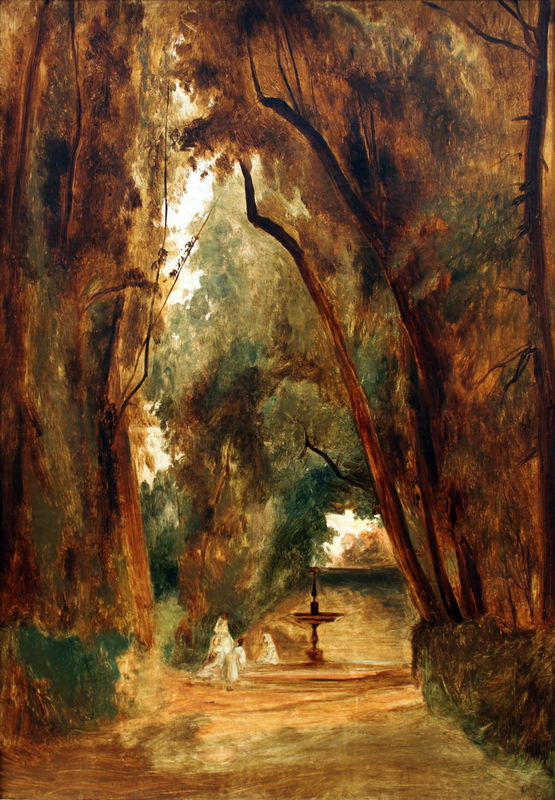 Carl Eduard Ferdinand Blechen, Im Park der Villa Borghese (In the Park of the Villa Borghese) (1823), oil on canvas, 78 x 63 cm, Alte Nationalgalerie, Berlin. Wikimedia Commons. 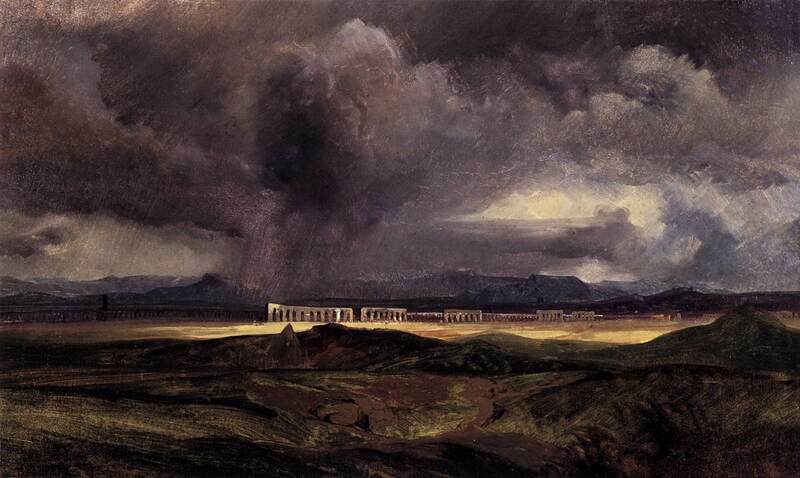 Carl Eduard Ferdinand Blechen, (Stormy Weather over the Roman Campagna) (1823), oil on board, 28 x 45 cm, Alte Nationalgalerie, Berlin. Wikimedia Commons. His copious plein air studies were in a similar style to those being painted in the early nineteenth century by others in the area, but were seen as being radically different back in Berlin. 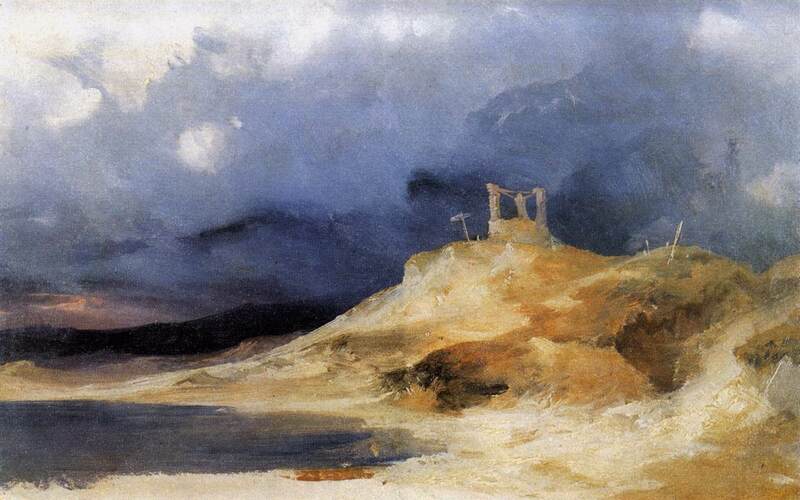 They invite comparison with the more experimental works of JMW Turner, for instance. 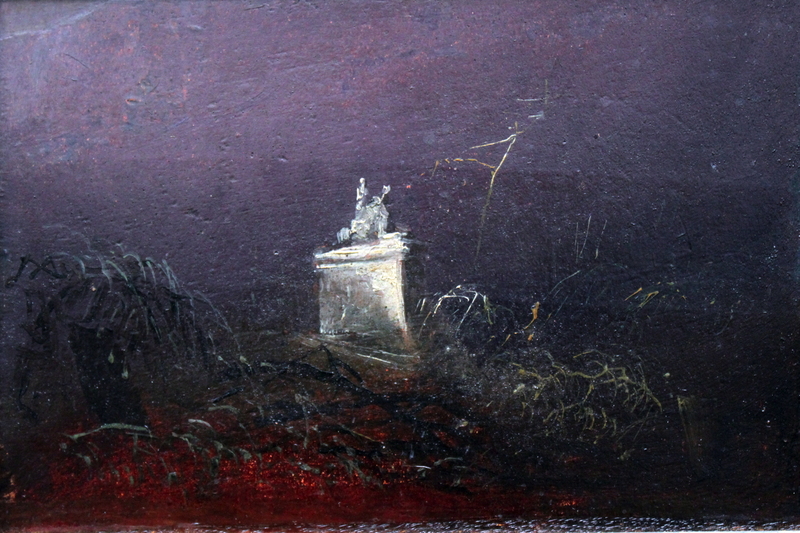 Carl Eduard Ferdinand Blechen, Grabmal (Study for a Funerary Monument) (c 1824-7), oil on board mounted on panel, 14 x 23 cm, Alte Nationalgalerie, Berlin. Wikimedia Commons. Carl Eduard Ferdinand Blechen, Tiberiusfelsen auf Capri (Tiberius Rocks, Capri) (1828-9), oil on paper mounted on canvas, 20.5 x 30 cm, Lower Saxony State Museum, Hanover. Wikimedia Commons. Carl Eduard Ferdinand Blechen, Meeresbucht in Italien (Bay in Italy) (1829), oil on canvas, 21 x 31 cm, Alte Nationalgalerie, Berlin. Wikimedia Commons. In 1831 he became Professor of Landscape Painting at the Berlin Academy, visiting Paris in 1835. However he started to manifest mental illness there. Carl Eduard Ferdinand Blechen, Galgenberg bei Gewitterstimmung (A Scaffold in a Storm) (c 1835), oil on paper mounted on board, 29.5 x 46 cm, New Masters Gallery, Dresden. Wikimedia Commons. The last of his paintings shown here is even more remarkable, in anticipating so many elements of Impressionism: it appears to have been executed rapidly in front of the motif (although a view from his studio over Berlin and Brandenburg), with many brush-strokes plainly visible; details are composed of stylised marks; it is an everyday if not banal subject, treated with a very informal composition. However his style does not seem to have been transmitted to any successor, except perhaps Adolph Menzel (1815-1905), who also appears to have been an outsider if not outlier. Carl Eduard Ferdinand Blechen, Blick auf Dächer und Gärten (View of Roofs and Gardens) (c 1835), oil on paper mounted on board, 20 x 26 cm, Alte Nationalgalerie, Berlin. Wikimedia Commons. On his return to Berlin he continued to suffer from bouts of depression, being admitted to hospital in 1837 as a result. He made a final visit to Dresden before becoming too ill to paint. He died in Berlin in 1840. Born into an affluent Jewish family in Berlin in 1847, Liebermann studied law and philosophy at Berlin University. In 1868 he moved to Weimar to study drawing and painting, serving during the Franco-Prussian War as a medic near Metz. After that he moved to Paris in 1873, where he was influenced by Millet, Troyon, Daubigny, and Corot. His early work shows strong influence by Millet in particular. From there he went to the Netherlands, Munich, and finally returned to Berlin in 1884. He established a reputation as a portraitist, with a style similar to Manet, and used his wealth to collect French Impressionist paintings, particularly by Manet. Among his more famous subjects were Albert Einstein and Paul von Hindenburg. 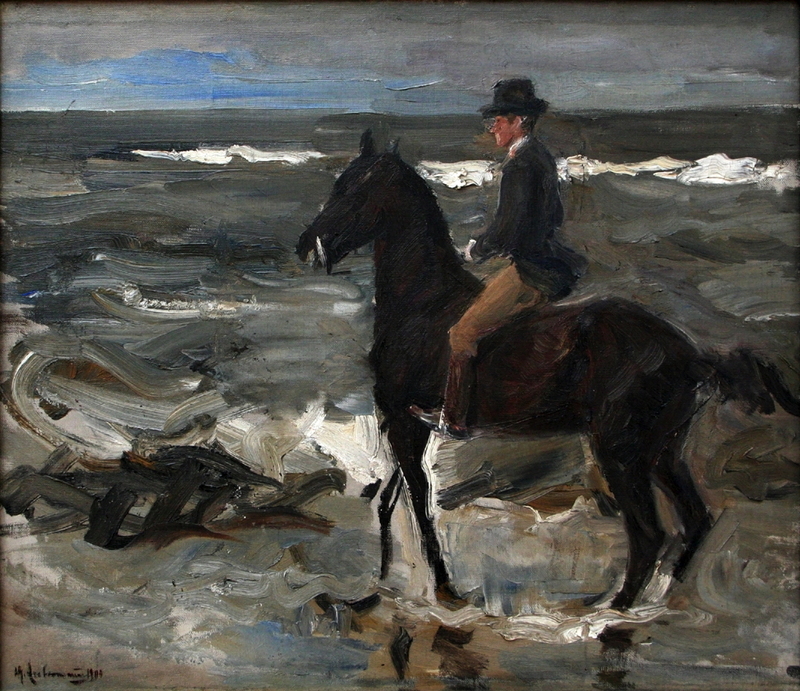 Max Liebermann, Le Cavalier sur la Plage (Rider on the Beach) (1904), oil on canvas, 46 x 55 cm, Musée d’art moderne et d’art contemporain de Liège, Liège. WikiArt. 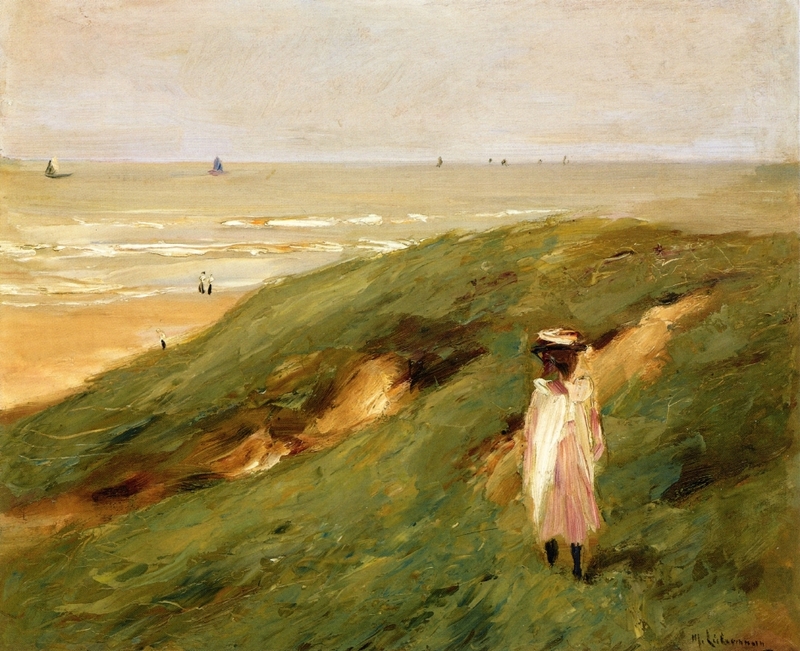 Max Liebermann, Dune bei Nordwijk mit Kind (Dune near Nordwijk with Child) (1906), oil on panel, 49 x 60 cm, Private collection. WikiArt. From 1899 to 1910 he was the leader of the Berlin Secession, the major avant garde movement of the day. In 1920 he became President of the Prussian Academy of Arts, but was forced to resign in 1933 with the rise of anti-semitism. He died in 1935, in Berlin. Corinth was born in Tapiau, Prussia, in 1858, and showed early talent for drawing. In 1876 he started studying at the Königsberg Academy, moving to the Munich Academy of Fine Art in 1880. Influenced by Courbet and the Barbizon School, he travelled first to Antwerp in 1884, and then to Paris, where he studied at the Académie Julian under William-Adolphe Bouguereau. However did not become influenced by Impressionism at that stage. 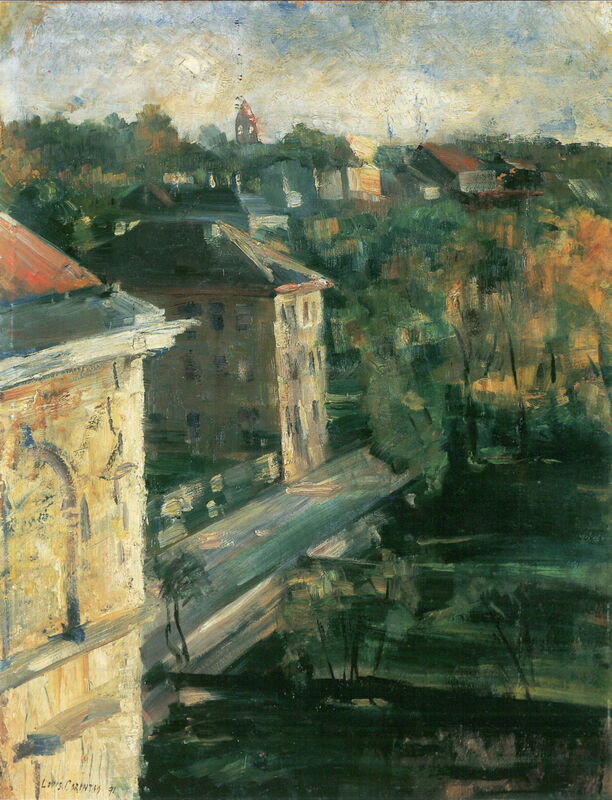 In 1887 he returned to Königsberg and assumed the name Lovis Corinth. In 1891 he went to Munich, only to abandon the Academy there for the Munich Secession the following year. This helped foster his eclectic style, which showed impressionist influence in some – but by no means all – of his paintings. 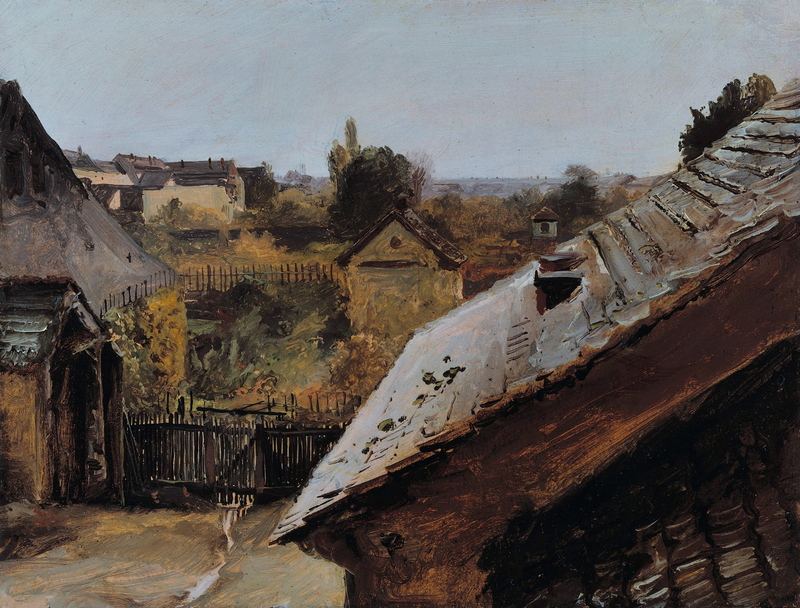 Lovis Corinth, Blick aus dem Atelierfenster (View from the Studio Window) (1891), oil on cardboard, 64.5 x 50 cm, Neue Galerie, Linz. Wikimedia Commons. 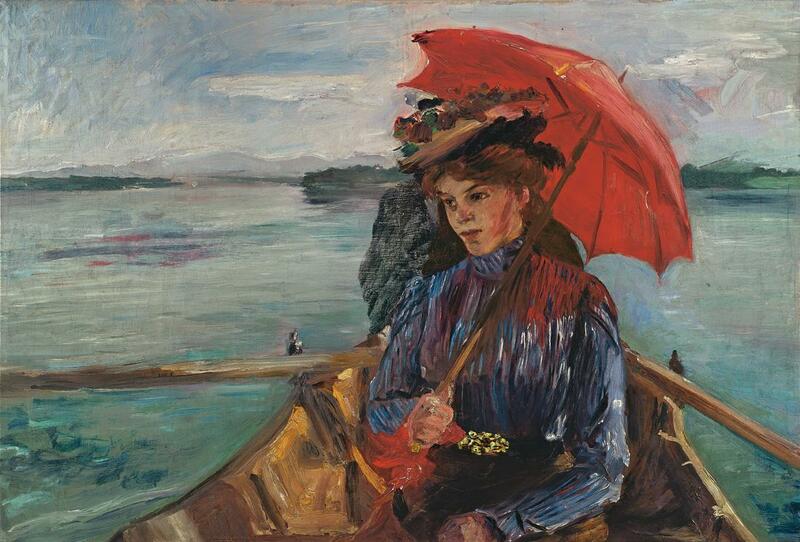 Lovis Corinth, Fräulein Heck (im Boot auf dem Starnberger See) (Miss Heck (in a boat on Lake Starnberg)) (1897), oil on canvas, 59 x 86 cm, Private collection. Wikimedia Commons. He moved to Berlin in 1900, where he opened a painting academy in 1902. He married his first student there, Charlotte Berend, who was the model for many of his paintings and his constant inspiration. His brushwork progressively loosened, his colours became brighter, and he started to capture more light in his paintings. 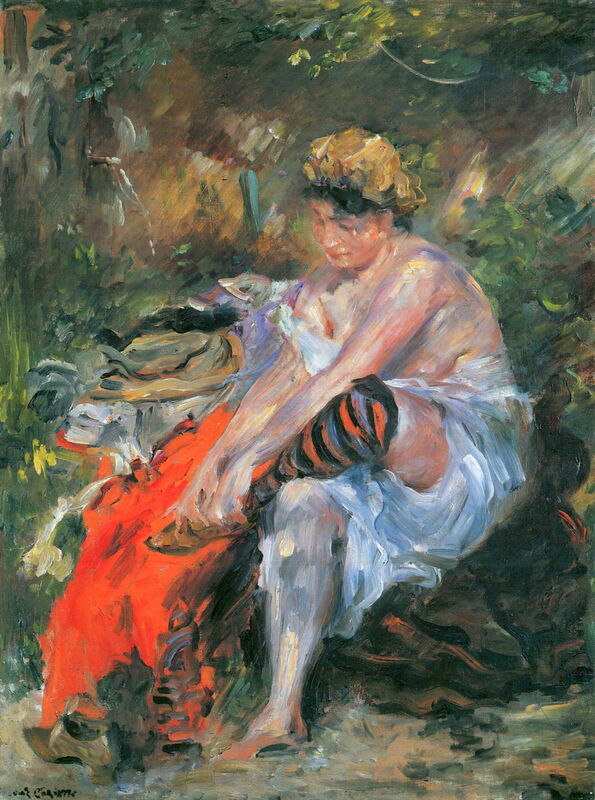 Lovis Corinth, Nach dem Bade (After the Bath) (1906), oil on canvas, 80 x 60 cm, Kunsthalle, Hamburg. Wikimedia Commons. In 1911, when he was only in his mid-fifties, he suffered a stroke, which stopped him painting for a year whilst he learned to use his right hand. This further liberated his brush-strokes, but left him with a persistent visuo-spatial problem which is reflected in some of his later works. 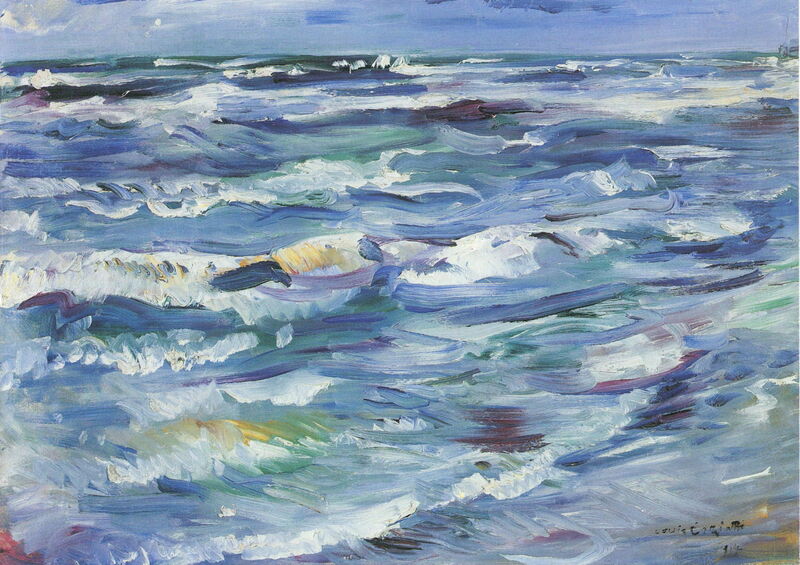 Lovis Corinth, Meer bei La Spezia (The Sea at La Spezia) (1914), oil on canvas, 60 x 80 cm, Kunsthalle Mannheim, Mannheim. Wikimedia Commons. In his later career he was an avid print-maker, favouring drypoint and lithography, and painted many landscapes near the Walchensee, in the Bavarian Alps. His style moved from impressionist to expressionist, although it remained distinctive throughout. He was President of the Berlin Secession from 1910 (taking over from Liebermann) until his death. He then travelled to the Netherlands, where he died in 1925. Slevogt was born in Landshut in 1868, and studied at the Munich Academy from 1884 to 1890. 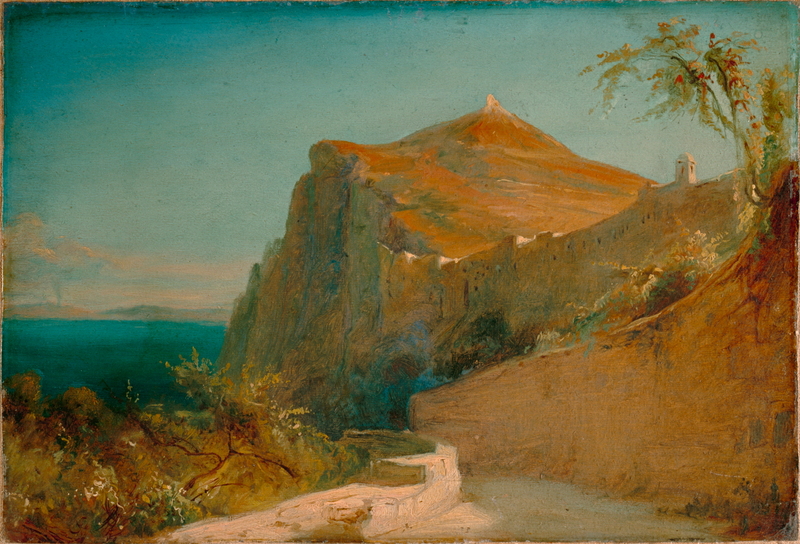 He then visited Capri in Italy in 1890, where he painted plein air. Some accounts claim that he went to Paris, and attended the Académie Julian (after Corinth had left Paris). He returned to Germany and Austria, and in 1900 visited Paris, where he was influenced by the work of Manet. He joined the Berlin Secession in 1901. He concentrated more on colour and light in landscapes from 1905 onwards, and from 1909 was further influenced by the landscapes of Sisley and Monet. 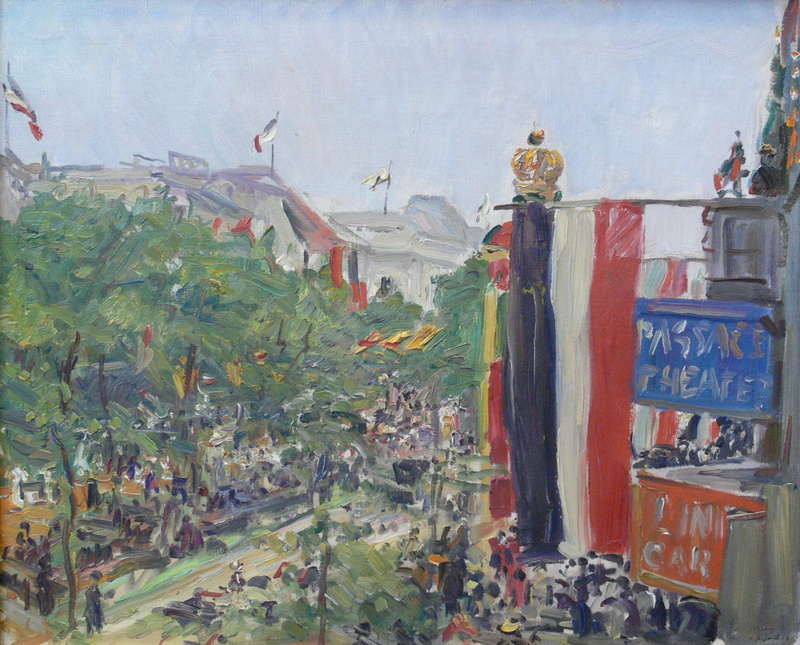 Max Slevogt, Unter den Linden (Under the Limes) (1913), oil on canvas, dimensions not known, Alte Nationalgalerie, Berlin. Wikimedia Commons. He travelled to Egypt in 1914, returning through Italy. He was an official War Artist on the Western Front. 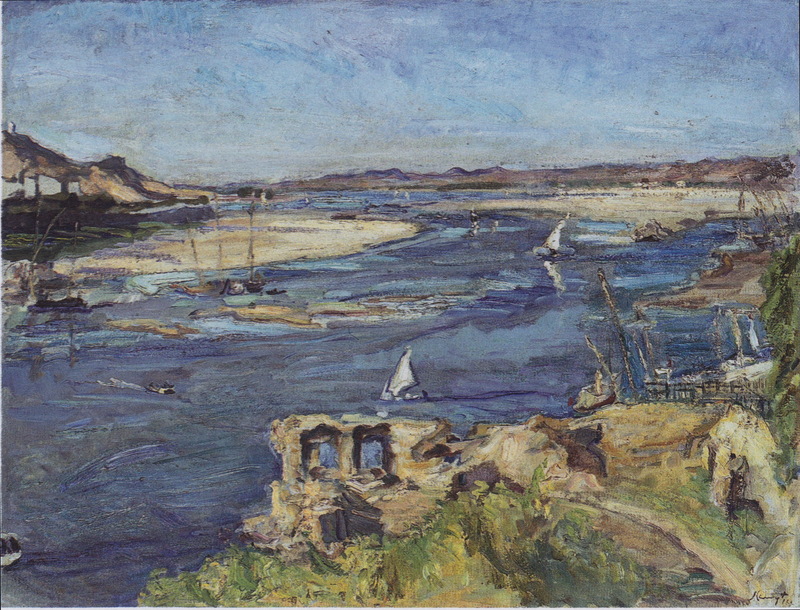 Max Slevogt, Der Nil bei Assuan (The Nile at Aswan) (1914), oil on canvas, 73.5 x 96 cm, New Masters Gallery, Dresden. Wikimedia Commons. In his later life he designed scenery for the Dresdner State Opera, and worked on a large religious mural which was destroyed during World War 2. He died in Bavaria in 1932. Posted in Painting and tagged Berlin, Blechen, Bouguereau, Corinth, Corot, Expressionism, Impressionism, Liebermann, Manet, Menzel, Millet, Monet, painting, Secession, Sisley, Slevogt. Bookmark the permalink.